There were 263,859 oil and gas wells drilled in the United States between 2000 and 2014. Until now we have not had comprehensive data on how much fresh water has been required to drill them. But now, thanks to a peer-reviewed US Geological Survey study accepted for publication in Water Resources Research, we have comprehensive data on how much water is used to drill hydraulically fractured horizontal wells. You can read the study by clicking on the graphic at right. What we now know is that the amount of water required varies widely. The research found that water volumes for hydraulic fracturing averaged within watersheds across the United States range from as little as 2,600 gallons to as much as 9.7 million gallons per well. The map below shows the average water use in hydraulic fracturing per oil and gas well in watersheds across the United States. To read the map I pulled out my handy dandy water measurement converter, and determined that one cubic meter of water = 264.17 gallons. The dark blue category can be read as 2.6 million – 9.7 million gallons. The lighter blue category represents 260,000 – 2.6 million gallons. Nearly all wells drilled in Montana fall into those two categories. According to the study, the amount of water used to drill wells is steadily increasing. From 2000 to 2014, median annual water volume estimates for hydraulic fracturing in horizontal wells had increased from about 177,000 gallons per well to more than 4 million gallons per oil well and 5.1 million gallons per gas well. Meanwhile, median water use in vertical and directional wells remained below 671,000 gallons per well. 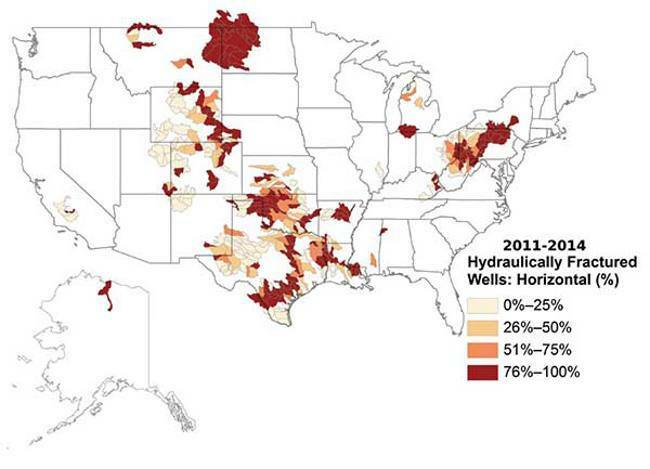 The map below shows the percentage of wells in in oil and gas producing regions that use horizontal drilling. As you can see nearly all of the wells drilled in the Bakken, Powder River Basin, and most other areas of Montana are horizontally drilled. The large majority of wells in Montana are hydraulically fractured. Based on activity in the surrounding areas and expectations set by drilling companies, we can expect that new drilling activity along the Beartooth Front will involve wells that are most intensive for water use. Hydraulically fractured wells in surrounding areas require substantial amounts of water, in the range of 2.6 million gallons per well. The amount of water required per well is increasing over time. The next question to consider is whether there is sufficient water availability to meet this demand, should there be a substantial increase in the number of wells. While the answer to this question depends in part on the source of water for drilling, there is good public information available on drought and water conditions in the area and throughout the West. Most of the western United States is experiencing some level of drought. You can see by clicking on the map at right that California and Western Nevada are mired in a long-term exceptional drought, and that extreme drought stretches throughout Oregon, Washington, Idaho and into western Montana. Stillwater and Carbon counties along the Beartooth Front are not technically in a drought. But water resources along the Beartooth Front remain scarce. The Surface Water Supply Index (SWSI) is a more complex measure that incorporates both hydrological and climatological features into a single index value for river basins. It includes snowpack, streamflow, precipitation, and reservoir storage into a single number centered on zero, with a range between -4.2 and +4.2. The map below, from the state of Montana web site, depicts the SWSI for all river basins in the state. 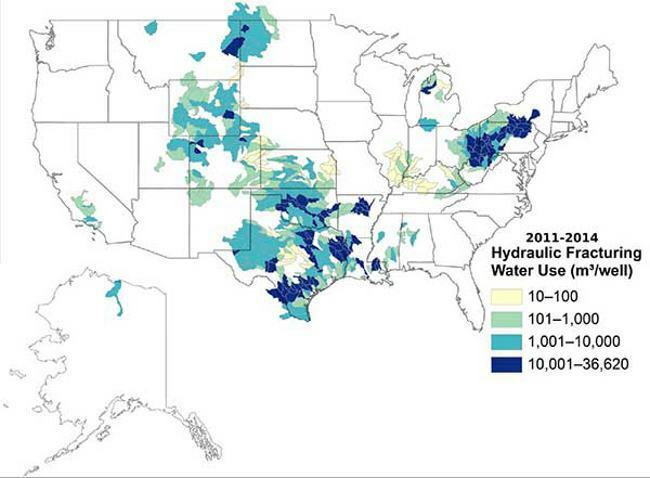 We now have clear documentation that shows how much water fracking consumes. It is a large amount, and wells are getting thirstier and thirstier over time. This has huge implications for the American West, much of which is experiencing some level of drought. In California, which sits on the Monterey Shale and has huge potential oil reserves, the current extraordinary drought, which in parts of the state are the greatest in history, the lack of available water may be enough to scuttle fracking plans. Montana is experiencing extreme drought also, and the toll on our river basins is significant. As our planet warms, we can expect these drought conditions to get worse. We also know, based on data from the Bakken and Powder River, that we can expect new wells drilled in the area to be hydraulically fractured. A rough guess, which I invite someone with more expertise to refine, is that new wells drilled along the Beartooth Front would each require about 2.6 million gallons of fresh water. So when a John Mork comes to Billings and announces plans to drill 50 wells along the Beartooth Front, what he’s saying is that he’s going to need to find 130 million gallons of fresh water to get that done. The Stillwater River from our deck. The water level is low. Now I don’t know where he would get that much, and I doubt he does either. But I would think that knowing where the water’s coming from should be a major factor in determining whether he ought to be allowed to drill the wells. We’ve learned that the Montana Board of Oil and Gas Conservation, which issues well permits, is not going to ask that question. The Montana Department of Natural Resource Conservation, which controls water rights, will not proactively make that determination. What needs to happen is that local communities, to protect their water supplies, must regulate how much local water is used to support fracking operations. This entry was posted in Fracking Information and tagged drought, horizontal drilling, hydraulic fracturing, Surface Water Supply Index, US Geological Survey, water, water conditions in Montana, Water Resources Research. Bookmark the permalink.